The Hippo signaling pathway is a complex network of proteins that controls organ size via regulation of cellular proliferation, survival and differentiation. Initially discovered by genetic mosaic screens in Drosophila, the core of the Hippo pathway is comprised of two highly conserved kinases centering on the mammalian effector proteins Yes-associated protein (YAP) and its paralogue Transcriptional co-activator with PDZ-binding motif (TAZ, also known as WWTR1)  (Figure 1). YAP and TAZ are transcriptional co-activators that associate with several DNA-binding proteins to drive gene transcription. Cell to cell contact triggers the Hippo tumor suppressor pathway that controls the localization of the main effector of the pathway, YAP proto-oncogene (as well as its paralogue protein TAZ) in the cytoplasm (right panel). In sparsely populated cells YAP and TAZ translocate to the nucleus to drive transcription of proliferative genes as well as genes that inhibit apoptosis (left panel). Triggered by various upstream stimuli e.g. cell-cell contact , the MST1/2 kinases together with SAV (WW45) phosphorylate and activate LATS1/2 kinases . Activated LATS phosphorylates YAP and TAZ on specific serine residues, particularly S127 and S89 in YAP and TAZ respectively . Phosphorylation of these residues generates a 14-3-3-protein binding site resulting in cytoplasmic sequestration , and also marks them for degradation by the proteasome , thus inhibiting YAP and TAZ activity. Mechanisms coupling extracellular signals with the core Hippo kinase cassette are complex and not yet completely understood. Recently, mechanical cues from the cytoskeleton including cell density, stretching, substrate stiffness, cellular tension, and G-protein coupled receptor signaling have been identified as regulators of YAP/TAZ activity (for comprehensive review see ) (Figure 2). Notably, mechanical signal regulation of YAP/TAZ can act either dependently or independently of the canonical Hippo pathway. 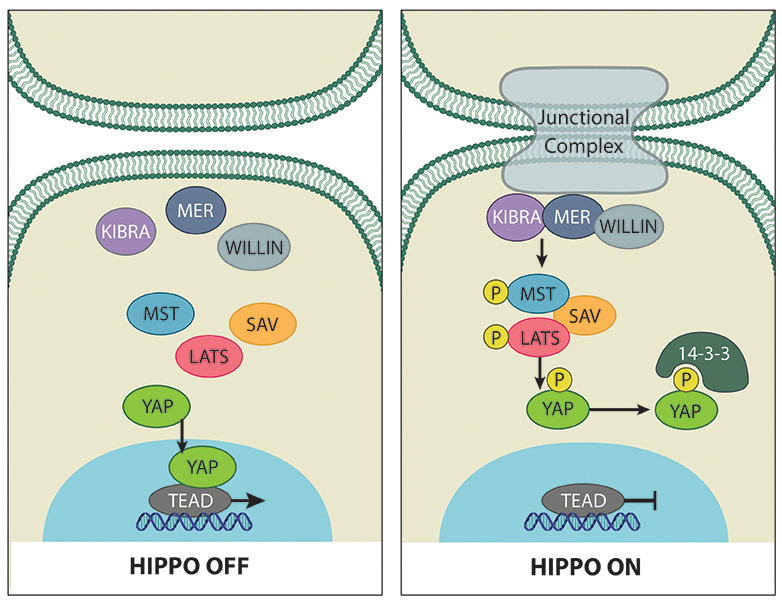 The canonical Hippo pathway comprises MST (Hippo kinase ortholog in Drosophila) and LATS kinases. Mechanical and topological cues regulate the localization of the YAP effector protein. Early indications that YAP/TAZ activity is regulated by mechanical cues came from the important observation that YAP localisation and phosphorylation status is regulated by cellular density . In sparsely populated cells YAP is predominantly localised to the nucleus and in its ‘active’ un-phosphorylated form. In contrast in high density cell culture YAP is phosphorylated and localised to the cytoplasm, and this process is regulated by Hippo pathway signaling . Similarly, analysis of YAP/TAZ localisation and activity within a cell monolayer  or three-dimensional epithelial sheet  demonstrated that the rigidity of the extracellular matrix (ECM) and cellular geometry can regulate YAP/TAZ in a Hippo-independent manner via Rho GTPase activity and tension of the actomyosin cytoskeleton . Further, sites of high mechanical stress within the 3D architecture have increased YAP/TAZ activity mediated by the F-actin capping and severing proteins (CapZ, Cofilin, and Gelsolin) . The latter study also revealed that mechanical stretching of contact inhibited cells exhibiting cytoplasmic localised YAP is sufficient to re-induce entry of YAP/TAZ into the nucleus to stimulate cellular proliferation . 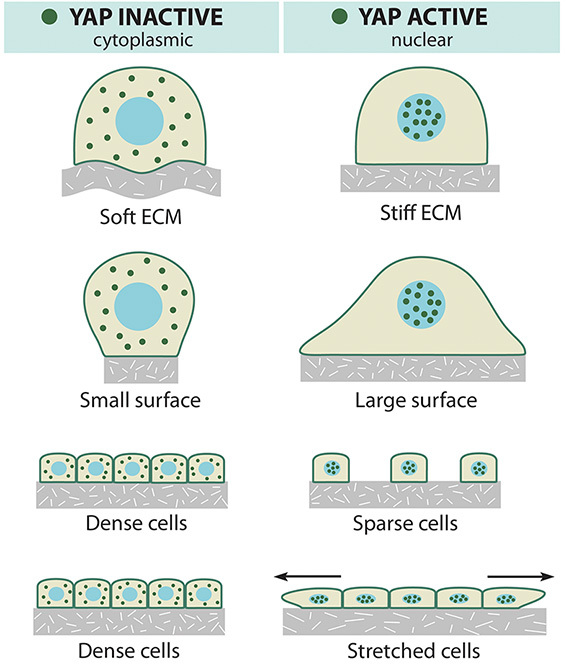 This observation is important for our understanding of how the ECM microenvironment can alter cell signaling, particularly relevant to tumorigenic transformation in which Hippo pathway dysregulation and changes in ECM stiffness have been profoundly implicated . In terms of delineating the mechanism linking the ECM and YAP/TAZ regulation, F-actin has been identified as a major player. In Drosophila imaginal discs, induction of F-actin formation induced strong overgrowth via modulation of Hippo pathway, resulting in nuclear localised Yorkie (the Drosophila orthologue of YAP) . This was supported by another study that used fabricated micropatterned cell adhesive areas called microdomains of various sizes to demonstrate that in cells grown on small domains, YAP was mostly cytoplasmic, whereas YAP was nuclear on large domains . These findings were correlated with the presence of stress fibers (consisting of F-actin), which indicated that F-actin-regulates phosphorylation of YAP via upstream regulation of LATS. Moreover, inhibition of actin polymerization using drugs such as Latrunculin A and Cytochalasin D, could prevent nuclear accumulation of YAP/TAZ and abolish their activity their transcriptional co-activators . Angiomotins (AMOTs) are known regulators of YAP/TAZ localisation and activity via Hippo-dependent  and independent  mechanisms. Recently, it has been shown that AMOTs can bind to F-actin, and in response to perturbation of the actin cytoskeleton dissociate from actin to bind and sequester YAP to the cytoplasm . Activated Hippo pathway signaling further enhances this process, since phosphorylation of AMOT by LATS inhibits F-actin binding to promote YAP cytoplasmic localisation . Regulation of YAP/TAZ activity by mechanical cues is multifaceted. Another mechanism linking cytoskeletal tension to regulation of Hippo pathway activity was identified involving Ajuba inhibition of Warts (the Drosophila orthologue of LATS). Apical localisation of Ajuba by binding to α-catenin is promoted by cytoskeletal tension . The outcome of this is that increased tension within the cytoskeleton increases Drosophila wing growth due to increased Yorkie activity and vice versa . YAP mediated mechanotransduction influences oligodendrocyte maturation and cell shape . The spectrin network is one of the most recently identified regulators of YAP/TAZ activity in response to mechanical stimuli. Spectrin functions as scaffold protein at the membrane–cytoskeleton interface via crosslinking of short F-actin filaments (reviewed in ). Reports from three groups identified spectrin as a regulator of Yorkie/YAP in fly and mammalian cells respectively, whereby mutation or depletion of spectrin induces Yorkie-dependent cell polarity defects or tissue overgrowth in Drosophila . Although one study found that dysregulation of apical spectrin alters the activity of the upstream Hippo pathway regulator Expanded , the consensus appears to be that the basolateral spectrin network regulates cortical actomyosin tension which subsequently regulates Yorkie/YAP/TAZ activity by an as yet unidentified mechanism. Interestingly, in addition to being regulated by the actin cytoskeleton, the Hippo signalling pathway exhibits feedback to influence actin assembly. F-actin was found to accumulate abnormally when Hippo pathway activity was reduced or abolished, though this was independent of Yorkie activity . Additionally, truncation of YAP in the medaka fish hirame (hir) mutant reduces actomyosin-mediated tissue tension via down-regulation of ARHGAP18, a Rho GTPase activating protein . The reduced tissue tension leads to tissue flattening and tissue misalignment, and indicates that YAP is required for the attainment of proper three-dimensional body shape. Thus perhaps YAP is the long sought after sensor of gravity proposed nearly a century ago by D’Arcy Thompson (Thompson, D. W. (1917) On Growth and Form, Cambridge Univ. Press). Importantly, numerous publications have identified YAP/TAZ mediated crosstalk with other notable signaling pathways including the Wnt/β-catenin and TGFβ-SMAD pathways, and G-protein coupled receptor (GPCR) signaling. YAP/TAZ have been shown to suppress Wnt target gene expression by binding the upstream regulator Dishevelled  and association with β-catenin to sequester it in the cytoplasm , and/or promote its degradation . Driven by the Hippo pathway, cytoplasmic localised YAP/TAZ sequesters SMAD complexes, effectively suppressing TGFβ signaling . Further, interaction of the Crumbs polarity complex with TAZ/YAP relays cell density information to regulate localisation of YAP/TAZ and abrogate transcriptional activity mediated by TGFβ . Recently, a functional connection between GPCR signaling and regulation of YAP/TAZ activity has been elucidated ,. Intriguingly, GPCR signaling can either activate or inhibit the Hippo-YAP pathway depending on the proteins involved by targeting LATS. 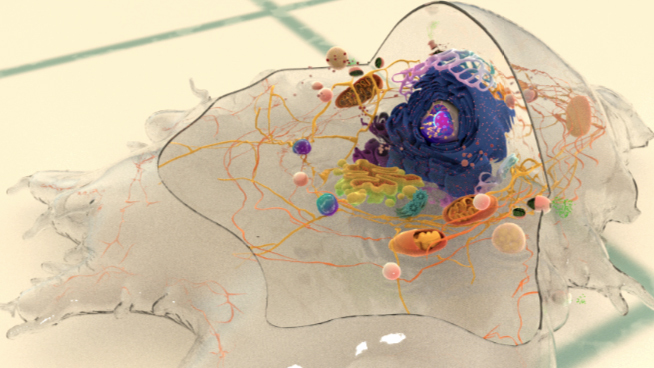 Given the integral relationship between the ECM, GPCRs, RhoA , and now YAP/TAZ signaling, these findings have significant implications for our understanding of how cells sense and respond to their environment in incredibly complex manners.